WILMINGTON, Del. - General Motors has awarded two contracts for advanced development of lithium-ion batteries for its electric drive "E-Flex System," it was announced today at GM's annual shareholder meeting. GM selected two companies out of the 13 technical proposals it considered to provide advanced lithium batteries for both range-extender electric and fuel cell variants of the E-Flex architecture. The E-Flex electric vehicle architecture underpins the Chevy Volt concept car shown earlier this year and is being developed as part of GM's strategy to diversify transportation away from petroleum. One contract will go to lithium-ion battery supplier Compact Power, Inc., based in Troy, Mich. CPI is a subsidiary of Korean battery manufacturer LG Chem. A second contract has been awarded to Frankfurt, Germany-based Continental Automotive Systems, a division of Continental A.G., a tier one automotive supplier that will develop lithium-ion battery packs. GM continues to assess other solutions to quickly bring lithium-ion batteries to production. "The signing of these battery development contracts is an important next step on the path to bring the Volt closer to reality," said GM Chairman and CEO, Rick Wagoner. "Given the huge potential that the Volt and its E-Flex system offers to lower oil consumption, lower oil imports, and reduce carbon emissions, this is a top priority program for GM." The E-Flex System was first shown as the plug-in battery electric propulsion system for the Chevrolet Volt concept vehicle at the North American International Auto Show in January. A plug-in fuel cell variant of the E-Flex system was shown at the Shanghai Auto Show in April. 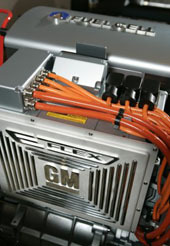 The "E" stands for electric drive; the "Flex" represents the architecture's adaptability to be configured in several vehicle packages operating on various sources of electricity. These suppliers demonstrated solutions that best met the specific energy, power, mass and durability requirements for the battery in the E-Flex range-extender variant. The battery for the fuel-cell variant requires half the energy and power, but must be integrated and connected to the vehicle in a similar way. "This technology is developing rapidly," said Denise Gray, GM director of hybrid energy storage devices. "These contracts are an opportunity to deeply understand the differing battery technologies before making a production decision." Coming this fall, models of the Chevrolet Tahoe and GMC Yukon SUVs that feature the world's first use of the 2-Mode hybrid system, providing a more than 25-percent improvement in fuel economy to what is already the industry's most fuel-efficient full-size SUVs. Due next year is a front-wheel-drive 2-Mode hybrid Saturn Vue Green Line, with plans to make a plug-in version of the Vue that has the potential to achieve double the fuel efficiency of any current GM SUV. In May, GM completed the longest fuel cell-vehicle demonstration drive in history with the 300-mile drive of the Chevrolet Sequel. It is also a leading producer of E-85 capable bio-fuel vehicles, with more than two million on the road. Additionally, GM provides more vehicles that achieve 30 mpg highway than any other manufacturer in the U.S. market. GM is also the first automotive member to join the U.S. Climate Action Partnership (USCAP), a group of global companies and non-governmental organizations formed to support an economy-wide, market-driven approach to reducing carbon emissions.